We, at Scyphus, strongly believe that it is our duty as a leader on the market to set the example by investing for a greener future for following generations. This is the reason why we are not simply producing recyclable cups but we are manufacturing biodegradable and compostable paper cups to wage war against plastic addiction and to help reduce waste. Conscious that we are a world of heavy consumers and that the lifespan of a disposable cup can last for only about 30 minutes, it is our responsibility to ensure that in the long run, we are producing solely compostable paper cups that can be put to use to protect and liven up our environment once they biodegrade and compost. At the same time, our compostable paper cups are totally food safe, guaranteeing a healthy option to every single health-conscious consumer. When our paper cups are composted, they do not turn into waste but become a valuable resource instead, drastically reducing food waste and enriching soils at one go. 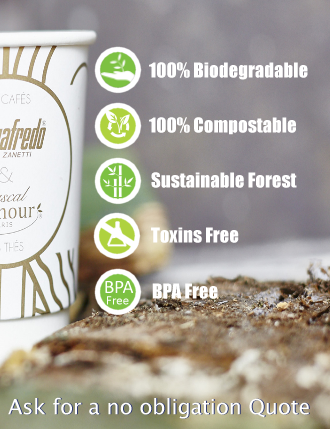 At Scyphus we pride ourselves that our compostable cups are esteemed as the best 100% UK manufactured in terms of quality, design and affordability. The reason is that unlike various brands showcasing their paper cups as being recyclable, our whole range of compostable products is completely respectful of the environment as at the end of their short lifespan, our paper cups turn back into natural elements. Recyclable paper cups, often referred to as PE cups, contain a certain percentage of plastic or wax that makes up a coating to prevent leakage. These cups can be recycled to a certain degree only and under specific conditions in specialized factories. This recycling process is problematic as it is not always possible to separate the plastic lining from the paper. At the end of the day, this type of disposable PE cups can build up into mountains of harmful waste. 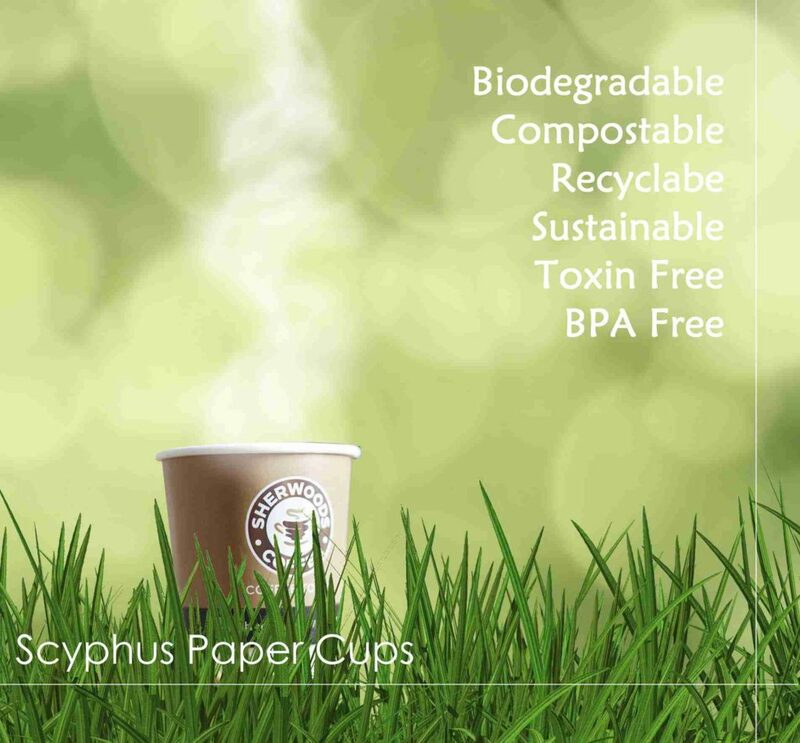 Scyphus compostable paper cups are totally different. Given that a paper cup without any lining or coating cannot hold any liquid, using a coating in paper cups is unavoidable. However, instead of using a lining made from petroleum-sourced traditional plastic, the lining that we use is made of bioplastic material otherwise known as polylactic acid (PLA) plastic derived exclusively from renewable sources. Bioplastic is generally derived from corn, soybean, bamboo, sugarcane, grass, cellulose or sugarcane and can hence break down into natural organic materials once disposed of. The PLA lining is sturdy and paper cups coated with it can hold both cold and hot beverages, especially when designed as a double wall paper cups. While a PE disposable cup can take up to 1,000 years to decompose, our compostable paper cup can take some months only to completely biodegrade and without leaving any toxins behind. After a short period of time after disposal, our compostable cups break down into carbon dioxide, water, inorganic compounds, and biomass at a rate comparable to that of well-known compostable materials such as leaves. In the food service sector, using such compostable products can enable food waste diversion. Prior to compostable products, food waste mingled with non-compostable packaging or containers represented two waste streams. Our cups can be disposed of straight into compost bins or landfills with any remaining beverage or food scraps as they will decompose together in an easy one-step process. Our compostable paper cups go a step further than biodegradable ones as they do not simply biodegrade but equally provide the soil with necessary nutrients and can be used as natural fertilizers. The organic material produced increases the nutrient content in soils, helping them to retain moisture and suppressing plant diseases and pests at the same time. The need for chemical fertilizers is largely reduced, promoting higher yields of agricultural crops. While poor soils are regenerated, landfills are also spared from methane emissions produced by non-compostable or non-recyclable waste. Even if bioplastic is made from plants, this does not mean that it is not resistant or durable. As a matter of fact, it looks similar to petroleum-sourced traditional plastic and presents the same resistance and robustness. As a result, it can be used to manufacture a variety of compostable products in the foodservice sector. Our branded double wall paper cups, often referred to as coffee cups, are much sought after for their durability, versatility and appeal by coffee shops, restaurants, food courts, cafeterias, universities, shopping malls and even car dealers. Available in various sizes, they are designed to maintain the beverages at the perfect temperature, protect against burns, and guaranteed not to turn mushy at the same time. When coupled with the finest yet toughest quality paper, PLA can even create such a coating to withstand ice cream or other cold desserts. Very soon, we will launch our range of compostable ice cream cups that will not only glorify the desserts visually and even from far, but will equally help protect the environment. Our state-of-the-art technology equally allows us to design and manufacture branded compostable cups and containers such as popcorn boxes. The latter can be used not only to serve fresh popcorn at cinemas but also to attractively serve certain food items such as nuggets. They can serve as mini billboards for brands while promoting them as green companies simultaneously. Companies have trusted us since our creation for our transparency, professionalism and finest quality products. To ensure that only the best products are being delivered to our clients, we are very much strict on the quality of raw materials we use to manufacture our compostable products. The paper we buy is exclusively obtained from FSC or PEFC certified mills only and is derived from sustainable forests. At the same time, we have made sure that the bioplastic used complies with the specifications established in the American Society for Testing and Materials in accordance with the “Biodegradable Products Institute-Certification Program for Products Made of Compostable Plastics-Program Rules”.